We’re often told that you should never eat anything (or put anything on your body) if you don’t recognize everything on the ingredients list. But since most of us have no idea what xanthan gum or potassium benzoate are — or more importantly, what they’re doing to our bodies — we’re decoding the ingredients in the many things Americans put in (and on) themselves with the help of an expert. This edition: Gold Bond Body Powder, which is made from eight separate ingredients that we’ve broken down in the exact order they appear on the bottle. 1) Talc: This ingredient is widely used in baby powders and body powders, since it absorbs moisture well and helps cut down on friction, which in turn prevents rashes. Unfortunately, talc has a bad reputation for being carcinogenic, which prompted Gold Bond (and a few other companies that distribute products containing talc) to produce a similar product that utilizes a safer, cornstarch-based alternative. You can check out that product here. Here’s why that cornstarch-based alternative was necessary: In its natural mineral form, some talc contains asbestos, a substance known to cause cancer in and around the lungs when inhaled. Despite the fact that modern cosmetic products are believed to contain asbestos-free talc, a 2014 study found that “one historic brand of cosmetic talcum powder” (left unnamed by the researchers) released inhalable asbestos fibers into the air when applied, which were then linked to the formation of pleural mesothelioma (aka lung cancer). 2) Zinc Oxide: A chemical compound commonly used to treat and prevent diaper rash, zinc oxide can be found in cosmetic products across the board. “As a skin cancer specialist, I use it to make sunscreen,” says Sharad Paul, skin-care expert, skin-cancer surgeon and author of The Genetics of Health. “It’s a good broad-spectrum filter that protects against ultraviolet rays.” In other words, zinc oxide is nothing to be afraid of. 3) Acacia Senegal Gum: “This gum comes from the sap secretions of a particular variety of acacia [a large genus of shrubs, lianas and trees], called acacia senegal,” explains Dagan Xavier, ingredient expert and co-founder of Label Insight. “It’s used as a bulking agent, emulsifier, stabilizer, thickener, foaming agent, gelling agent, suspending agent and whipping agent.” Most importantly, though, acacia senegal gum has soothing and conditioning properties, which probably accounts for your nether region feeling pleasantly soft after being blasted by Gold Bond powder. 4) Eucalyptol: “Eucalyptol is a colorless volatile oil predominantly found in eucalyptus, but also in basil, rosemary, sage and cardamom,” explains Xavier. “It’s often used to provide a pleasant aroma or fragrance in personal care products.” Paul adds that in certain cases, eucalyptol may also be used as a denaturant — that is, an additive that discourages recreational consumption by producing a revolting taste. So Gold Bond might add this to their powders to keep small kids from chowing down on the stuff while you’re changing their diaper. 5) Methyl Salicylate: Also known as wintergreen oil, methyl salicylate has anti-inflammatory properties. It’s probably used in Gold Bond powder to soothe irritation by providing that cool-but-warm wintergreen tingle. 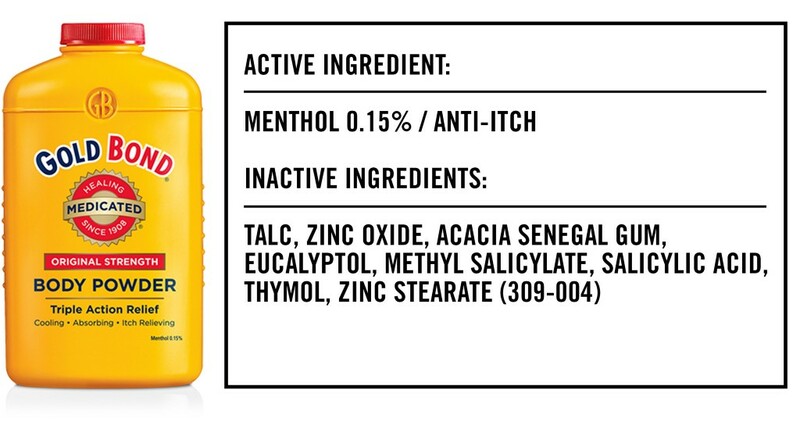 6) Salicylic Acid: Derived from the bark of willow trees, salicylic acid helps shed dead skin, according to Paul. While that’s usually a good thing, too much of the stuff can cause dryness and irritation, so use moderation while powdering yourself. 7) Thymol: Thymol occurs naturally in thyme, hence the name. “It’s said to have a pleasant aroma and is a powerful natural antiseptic and antioxidant,” Xavier explains. It’s probably added to prevent anything funky from growing both in the powder bottle and in any of the nooks and crannies on your body. 8) Zinc Stearate: Zinc stearate is used both as a lubricant and for its water-repellent properties, which are vital when applying a product that’s meant to ward off swamp crotch. The only real problem ingredient found in Gold Bond Body Powder is talc because, well, asbestos. In all likelihood, though, this talc won’t harm you: “The FDA looked into the issue and couldn’t conclusively prove asbestos contamination,” Paul notes. “But [consumers] need to understand the potential risk.” Still, to err on the side of caution, maybe use Gold Bond’s cornstarch-based product for your chafe-or-moisture-related needs instead. It provides the same relief, but without the cancer.